Rebecca of Sunnybrook Farm is the first of four Mary Pickford films being screened as part of “Mary Pickford and the Invention of the Movie Star,” an exhibit dedicated to the silent icon (and Toronto native) beginning January 13th, 2011, at Toronto’s TIFF Bell Lightbox. The exhibit is located on the fourth floor of the Lightbox, in the new Canadian Film Gallery, and features some 300 items, including photographs, posters, memorabilia, postcards, and products endorsed by Pickford, assembled over a 30-year period by private collector Rob Brooks. It’s curated by Sylvia Frank, Director of the Toronto International Film Festival’s Film Reference Library and Special Collections. TIFF Bell Lightbox screens Rebecca of Sunnybrook Farm this Saturday, January 15th, at 11:00 am. It will follow with Sparrows (January 16th); Daddy-Long-Legs (January 22nd); and The Poor Little Rich Girl (January 23rd). 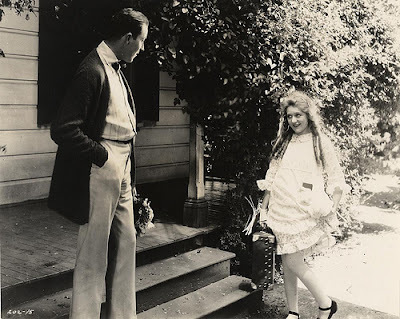 No one saw Mary Pickford quite like Marshall Neilan. He knew her as a friend, and understood her as her fans did. She took risks before his camera, and he directed her with the lightest touch; letting the artifice of his films ebb away until nothing remained but a veneer through which she shone. Though he didn’t make her greatest movies, I believe she was never greater than when she starred in his. Neilan’s and Pickford’s first collaboration was Rebecca of Sunnybrook Farm; one of the breeziest, purely funniest Pickford films around. It’s more a collection of one-reeler comedies than a whole movie, and I suspect a lot of its source material is missing here (I haven’t read the book). What is intact is Rebecca Randall (Pickford): the second of seven children, raised by a widowed mom with little money; precocious, bright, but unappreciated; selected to move to Riverboro, Maine, to live with her spinster aunts: the fearsome disciplinarian, Miranda, and the heartbroken milquetoast, Jane. Rebecca’s like a ginseng cure to the closed and quietly unhappy lives of her guardians; like Marilla Cuthbert or Daddy Warbucks, they unfurl in the presence of the child; returning to balance. But we don’t see much of this going on; we mostly just witness its results. In Rebecca of Sunnybrook Farm, the twists that have to happen, happen fast, and supporting characters don’t have much to do, besides clear space for Pickford to perform. And she makes the most of it, as usual. You often hear how silent stars ‘acted with their faces.’ But only the very best did it memorably—in part because only the best got enough close-ups, for long-enough, to demonstrate their skill. In Rebecca of Sunnybrook Farm, at about the eight-minute mark, Pickford demonstrates hers. 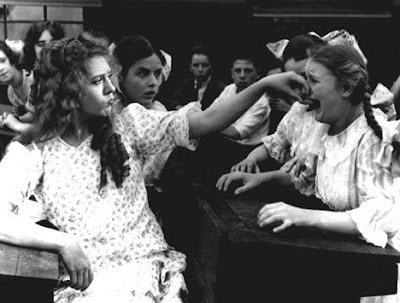 After Rebecca arrives in Riverboro, but before she meets her aunts, she’s accosted by the town’s reigning alpha-tween: Minnie Smellie (Violet Wilkey). Rebecca doesn’t know what to make of this girl, but soon she’s jabbing the point-end of her umbrella in Minnie’s solar plexus, backing her down. The umbrella but concludes a series of subtler actions. First are the nervous glances Rebecca darts toward the girls; intercut with Wilkey’s own stern, unchanging and aggressive face. Rebecca’s eyebrows rise and her mouth pulls down to a pout; she sizes up Minnie and her followers, then turns attention to her own hat, umbrella, and shoes; realizing they’re the cause of Minnie’s scorn. Now her mouth tightens and she holds her chin high in defiance. Snaps her head to one side as a threat. Turns away. No words are spoken here, even through intertitles, but no one could misunderstand. Emotions flow over Pickford’s face like liquid. Rebecca goes on to have many adventures: selling soap door-to-door to help the needy; staging a frighteningly dangerous circus show manned by children; using Visitor’s Day to debut her poem about Minnie’s impending beatdown in front of their class, teachers, and town elders. Each scene works as a self-contained piece of comedy, more or less, but all you can really say for them is that Pickford’s front and centre, and consistently good. Likewise for Rebecca’s few moments of true pathos, though if you ask me, Neilan never wanted us to feel moved by them, at least for long. The film’s too aware of its own silliness, its own contrivances, to ask for sympathy. It’s rather modern that way. 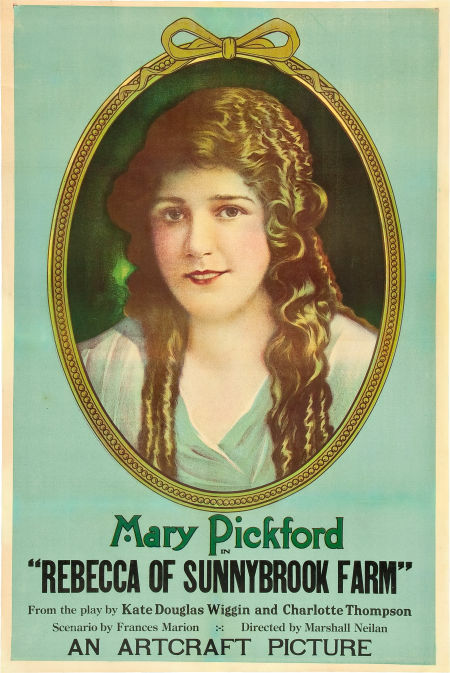 Mary Pickford’s reputation has suffered somewhat in our era—her films don’t age as well as say, Chaplin’s or Keaton’s, and none of them, with the exception of Sparrows (1926), are hailed as high art. Yet Pickford was massively talented; a formidable physical comedienne and dramatic mime, and she’s in total command in this film; so much so that I sensed we were seeing the ‘real’ Mary onscreen. Rebecca is more than the stubborn, plucky waif of Pickford’s lesser films—she has an edge and doesn’t suffer fools, and the look on her face when she meets one isn’t couched. Pickford must have had this steely streak in her. She was a businessperson, as well as an artist—a very driven human being. Neilan witnessed this, and at times, probably suffered its consequences. With Rebecca of Sunnybrook Farm, he proved he could step out of the way. We're excited to have her work showcased too! I attended the media preview this morning, and yes, the exhibit is fantastic. If you're a Pickford fan, you should see it. And if you're *not* a fan, you should really see it.